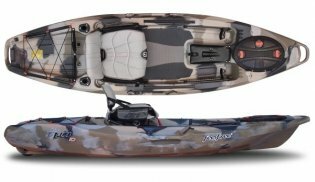 Fishing Kayak Reviews Feelfree "Lure 10"
Feelfree Kayaks is taking kayak fishing to a new level in comfort, stability, and versatility with the new 2014 Lure. The "Lure 10" is the smaller more compact brother of the Lure 11.5 and is excellent for shorter trips on rivers and lakes without comprising features. I have owned this kayak for 2 years. I really like this kayak for fishing small waters. The seat is fantastic, but check it often for loose bolts. The wheel is nice to have on solid ground. It's a good idea to pull or push the yak with both hands placed on opposite sides of the front handle, it makes it roll better without trying to tip over. I use a longer paddle which comes in handy when paddling with the seat raised. This yak is heavy, but I get it on the roof rack on my Jeep by tying a 6 foot rope to the back handle of the yak, and the other end to the bumper hitch on the back of the Jeep. that keeps the wheel from rolling the yak away from the Jeep. Then I lift the nose of the yak up to the roof, resting against the rear hatch. I attach 2 pvc pipes on either side of the roof rack extending out from the back of the Jeep about 3 feet to keep the nose from slipping off to one side or the other when I lift the back, then I just lift the back of it, and it slides right up without a lot of effort due to leverage. I wish I had a video of how this works, I'll try to post one soon. I love this kayak. slow!!! drinks in holders get crushed by seat.